The L1 LED flashlight provides a concentrated close quarter beam. The LED lamp produces up to 50,000 hours of usage and uses four replaceable LR 44 1.5V Alkaline coin cells (included) for over 100 hours of battery life. 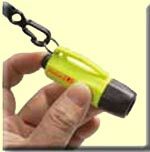 Includes break-away safety lanyard and a handy push button on/off end switch. 1.5 V 130 hours 2 5/8" 0.106 lbs.